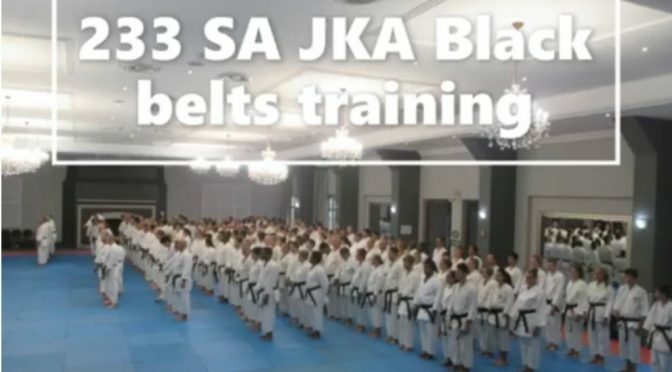 On Saturday, 2 February 2019, 233 black belts from across South Africa gathered for the annual SA JKA Standardisation Seminar. Sensei Eugene pre-registered eight of his seniors in the week prior to the seminar. Thank goodness, because that meant we did not have to be there at 07h00 for registration. Sensei Johan le Grange, our chief instructor, opened the seminar at 09h00 with a group session for all attendees. This session was fast paced, and I, for one, was completely out of my comfort zone. But, I tried…and failed…and then I tried again. The hall was abuzz with energy! Sensei Johan explained that our hands, feet, arms and legs are our weapons: if you cannot effectively use your weapons, then why do you have them. TING!!!!! Lightbulb moment or me. At 9:45 the dojo heads moved to a different hall, which gave us a little bit more space to train in. The 10:00 slot was taken by Marina Valassopoulos , who grilled us on the technicalities of Empi kata. Correct body posture, deep zenkutsu dachi and speed was practiced over and over and over, until our legs were weak and wobbly . But, our spirits were anything but weak and wobbly, because we thrived on the new knowledge passed on. After Sensei Marina , Sensei Jon Williams taught us how to make Kanku Dai kata your own. As everyone knows, Kanku Dai has 65 moves . Although we all understand the technicality and execution of the moves , Sensei Jon asked us to make this Kata our own: to make any kata, for that matter, your own. Put your personality into a kata, demand attention, while being mindful of speed and technical execution. By now we were sweating! Everybody had the look of “I’ve just been licked by a happy, drooling bull mastiff”. Our seniors (above 50 years) kept up the pace, inspiring us all. The 11:15 timeslot was taken up by Sensei Charles Beckenstrater Who taught us the art of Geri Waza. We were paired with a partner and taught how to properly position feet with different kicks and execute the kicks effectively with your hips. First sequence was Mae Geri-Kekomi Geri where the aim is to push your partner and kick right through him or her. Pressure, execution, fast thinking (if you are on the receiving end of a killing kick). Afterwards, Sensei Chris Seabelo broke down Tekki Nidan for us. He taught the bunkai of parts of the kata, affording us the opportunity to practice the various applications on our partners. At first, we were confused and went slowly. But, as we got the hang of it you just saw bodies flying and falling on the ground. It was great fun to do a kata and execute the bunkai effectively. The SA JKA Karate Assciation held its annual Standardisation Seminar and AGM on Saturday 2 February at The Wanderers Club. 233 SA JKA black belts attended the training. LUNCH – time to refuel very tired and drained bodies. From 13:30 – 14:30 we were treated with a presentation by a Neurologist, who lost his leg in a terrible accident. He explained to us how to use your mind set (observation) to change the outcome of your faith. He also explained the science behind moving and thinking and training your brain to do what needs to be done. Senseis Daniel Gombe and Gert van Niekerk took the final hour, working hard on our stances. Sensei Gert combined stances, slow then fast. Then, after one had mastered the sequence, you got to practice against a partner, including some take downs. Again, you just saw legs in the air as partners went flying and falling all over the place. But as soon we landed, we got up, switched and continued with the sequence. This was a great way to end an awesome six-hour training session. As a black belt you will know that you never ever stop learning and, for this reason, we know that karate is a sport for life.